This tiny isle in the Dodacanese, a national monument, was buit by 19th-century sponge and spice merchants. Now it draws travellers seeking laid-back charm, luminous seas and a balmy climate. 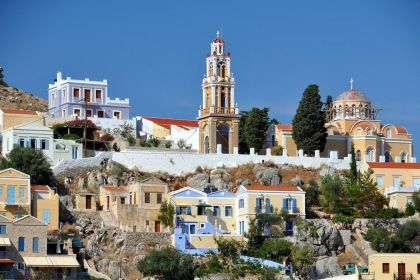 It has been dubbed ‘the best Greek island to visit’ by Condé Nast Traveller, and Symi certainly lives up to the hype. With the scores of peach and apricot-coloured neoclassical mansions tumbling down its hillside, it is doubtlessly one of the prettiest sites in Greece. 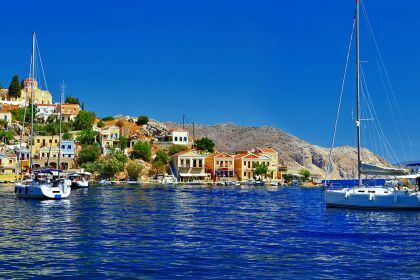 Conveniently close to the Kos and Rhodes, the smaller and quieter Symi will bewitch you from the moment your luxury yacht approaches its harbour. Simi is a beachlovers’ paradise. Many of its beaches are easily accessible by yacht, so it’s an ideal destination for an island-hopping adventure. Make sure you add the port of Yialos to your itinerary, too. Its shore is lined with mansions, whose ground floors have been converted to cafes with waterside terraces — perfect for whiling away lazy hours. 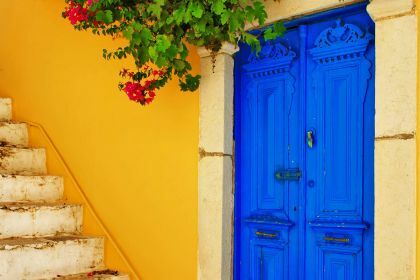 Symi is popular with visitors for good reason: not only does it have lovely beaches, but it boasts thriving downtown districts in Gialos and Chorio, some fascinating festivals and a year-round programme of events. For history lovers, the Museum of Symi has a fascinating collection of artefacts from important archaeological digs, as well as folklore exhibits that highlight the island’s rich cultural history. 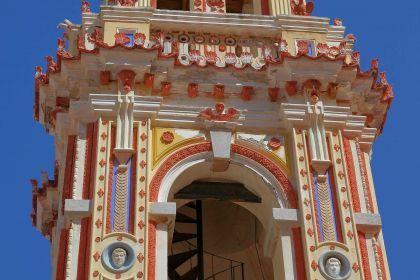 Churches and monasteries are another feature of Symi. Make sure you visit the beautiful Monastery of Panormitis (considered the protector of the island), on the southern side of the island. Dedicated to the Archangel Michael, it dates back to the 15th century. The frescoes, icons and fragrant herbs will charm you as you wander its ancient pathways. Cruise along the coast of this sparsely populated island in your luxury yacht, drop anchor in a secluded cove, and revel in the peace and quiet. A vist to Symi is incomplete without its foodie offerings. Imagine picturesque tavernas by the sea, fine-dining restaurants, and traditional ouzo and meze tavernas catering for all tastes. If you choose to have your meal at the popular Tholos, ask for a table on the waterside terrace so you can dip your toes in the sea while waiting to be served. The local specialty is “Symi Shrimps” – and they are particularly succulent here. The sea, the skyline of windmills and excellent service all add up to a first-class dining experience. Another good spot is The Olive Tree Café, serving tantalising homebaked cakes and pies. It’s situated near the top of the main thoroughfare, Kali Strata, so take a leisurely stroll to walk off your meal. Other recommended options include Taverna To Spitiko (Gialos) and Odyssia. Insider tip When planning your visit to Monastery of the Archangel Michael Panormitis, make sure you schedule it for any day other than a Sunday as it become very busy. To truly appreciate the tranquility and sense of history that oozes from every stone, pick a quieter day, and you’ll revel in every moment of your visit to this beautiful place.